Grigori Rasputin was born in Siberia around 1869. He was a healer and prophet to those who swore by his powers, but was known as the “mad monk” by those who believed him to be a con artist. He arrived in St. Petersburg in 1906 and was introduced to the Czar and Czarina, who were desperate to find help for their hemophiliac son, Alexis. After Rasputin prayed over the boy and changed his treatment slightly, the boy lived despite dire predictions by the doctors originally treating him. This may have just been by coincidence or the fact that Rasputin ordered that the boy stop being given the newly discovered drug Aspirin (Aspirin being the opposite of helpful in this case). With the boy seemingly getting better, Rasputin was now held in extremely high regard with the rulers of Russia, particularly Alexandra. Over the next 11 or so years, his influence in Russia continued to grow, both with certain members of the aristocracy and with the peasants of Russia. Those were tumultuous times in Russia, and Rasputin soon became embroiled in controversy. His sexual exploits were considered questionable at best; he was too friendly with the Jews for some people’s liking; he was openly anti-war; and had no qualms about flaunting his connection with the Czarina. Many were already resentful and suspicious of Alexandra’s German roots, so any other reasons for disliking her were warmly welcomed. Rasputin’s alleged hold over the Imperial family was used both against him and the Czar, although in reality Nicholas was far less enthralled with this supposed healer than his wife. This didn’t stop politicians and journalists from using Rasputin to weaken the Czar’s position, and many nobles also clamored for Rasputin to be banished from the Court. Considering his entrails were hanging out of his body, you’d think that would be a safe assumption. But after what was described as “intensive surgery” he survived, although he had less energy and required regular doses of opium for the rest of his life. But his enemies weren’t going to give up that easily. 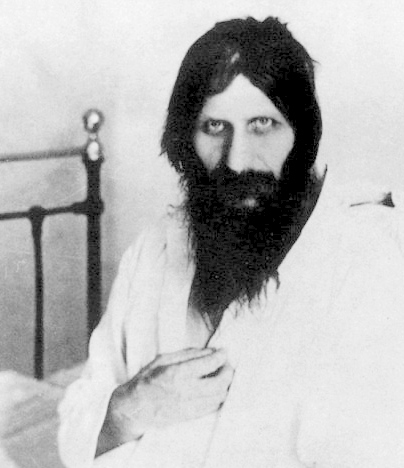 Having decided that his sway over the Czarina was dangerous to Mother Russia, several nobles led by Prince Felix Yusupov and the Grand Duke Dmitri Pavlovich allegedly coaxed Rasputin to Yusoupov’s palace on December 30, 1916 and served him cyanide-laced cakes and wine. Although there was supposedly enough poison in the food and drink to kill many men, Rasputin seemed unaffected. Reportedly, disappointed that the cyanide was not working as quickly as hoped, they worried there wouldn’t be time to hide Rasputin’s corpse by morning. Clearly something had to be done, so Yusupov shot him in the back. Rasputin went down, and everyone left the palace for a bit to give him time to die. When Yusupov came back to check on what he figured would be a corpse, Rasputin supposedly suddenly grabbed him by the throat and tried to strangle him. However, other accounts from the conspirators stated they only returned to the cellar upon hearing a noise and they found Rasputin alive and struggling to get away. Whatever conspirator’s account is perfectly accurate, if any, they all agreed that next Rasputin made a break for it. He was intercepted by three of Yusupov’s co-conspirators, who fired another three bullets at him, once hitting him in the forehead, and Rasputin fell once more. Incredibly, when they approached his body, he was reportedly still alive and trying to stand up, though the murderers did not agree on this point in their later confessions. What they did agree on was that they clubbed Rasputin into a bloody pulp, wrapped him a blanket and tossed him into the icy Neva River. The body was found a few days later and an autopsy was subsequently performed. So what did the autopsy indicate? As mentioned, it isn’t known exactly because the report was lost during Stalin’s rule. What is known, though, is that no trace of any poison was found in his stomach, though traces of alcohol were discovered. Further, aside from the bullet wounds and apparently having been beaten, a small amount of water was found in his lungs. Once their scheme was discovered and they were placed under house arrest, it seems odd that the conspirators would all make up that they had first tried to poison him before shooting, beating, and drowning him. If it is assumed they did not make that part up, then it has been suggested that perhaps the cyanide vaporized while the cakes were being baked. The problem with this theory is that the Prince, along with Vladimir Purishkevich, stated that the cyanide was carefully sprinkled on the cakes, not baked in. Further, the cyanide was reportedly added to the wine at the last possible moment, to keep it from evaporating. Needless to say, whether he was actually poisoned or not is still a matter of debate. As stated and supported by surviving pictures and the conspirators’ accounts, his body had definitely been shot several times, and appeared to have been beaten (though whether it was in that order or not, isn’t known). He also did have a small amount of water in his lungs. However, this isn’t necessarily a sign that he was still alive at this point as it isn’t uncommon at all for some water to be in the lungs after a body has been left submersed in a river. Further, the shot to his forehead would likely have been instantly fatal. Whatever the case, the trial that was to take place was canceled due to the conspirators being members of the aristocracy, so they were never officially convicted. Instead, they were simply exiled. Needless to say, this did not sit well with the peasants, who were already extremely unhappy with their monarch after disastrous military exploits that cost over 3.3 million Russian lives and resulted in nearly the entire destruction of the Russian naval fleet. Within three months of Rasputin’s death, the Tsar of Russia, Nicholas II (Nicholas Alexandrovixh Romanov), was forced to abdicate his throne and within a year, Nicholas II, his wife, his son, and his four daughters were murdered, along with the family’s chef and the Empress’ lady-in-waiting. Where Did the Word “Assassin” Come From?